Right now I'm sitting in the RAV4 at the Mojave AQMD in Victorville charging up and figured I'd post this while I wait. 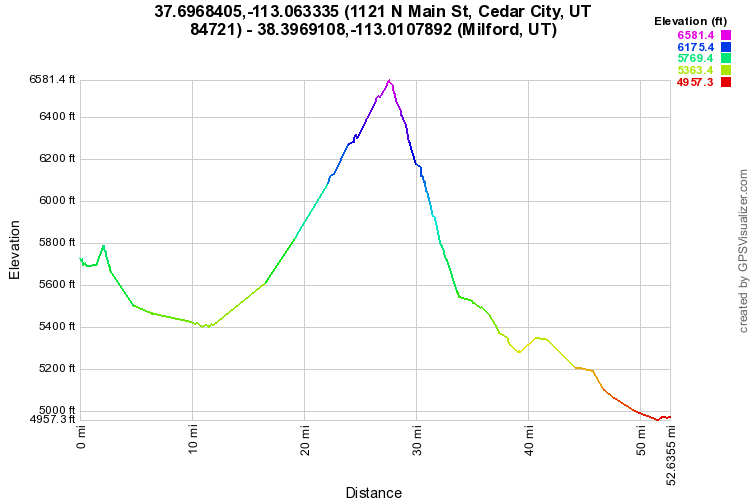 We're doing a 500 mile trip from LA to Milford, UT. We left LA this morning at 4:45A in order to do the first leg before it got too hot and before there was much traffic. 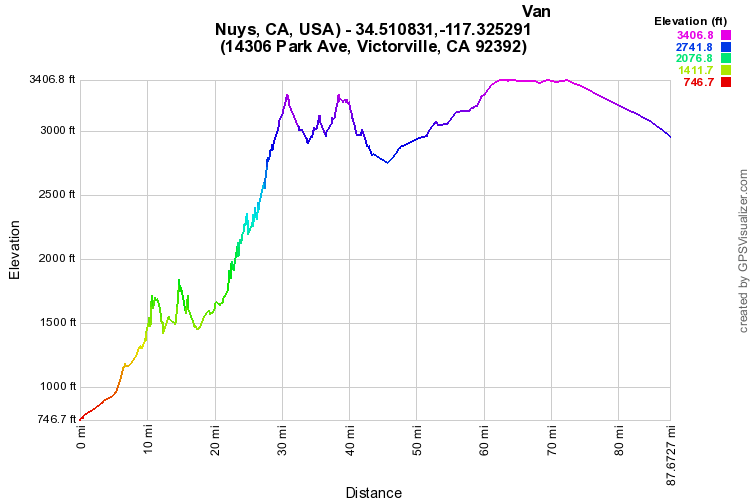 We made it to Victorville at about 6:40A with 16.4kWh (8 bars) to spare. From LA to Victorville we took the 405 to the 14 and then connected over to the Pearblossom Highway into Victorville. 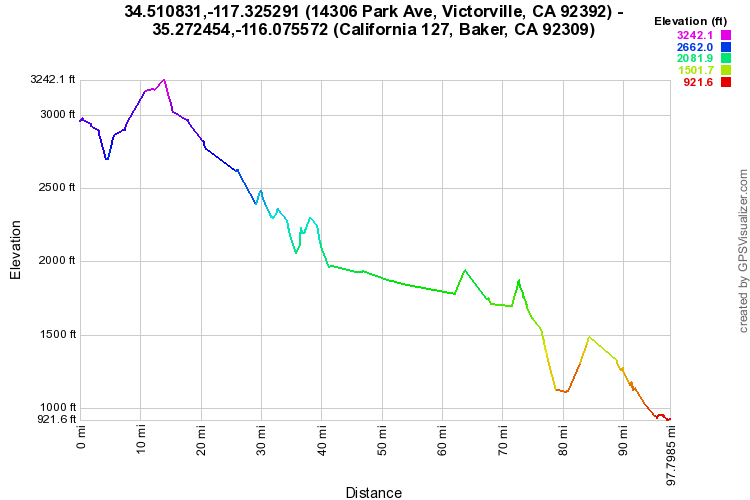 Here's the elevation profile for that part. 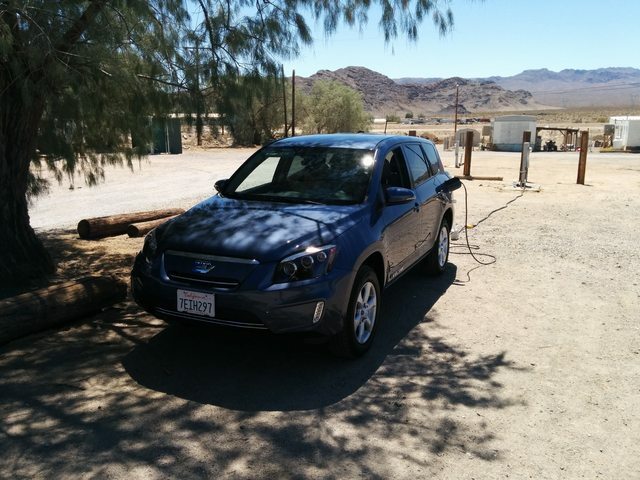 Next, we're going to head over and charge at an RV park listed on Plugshare in Baker. I'll get to give the OpenEVSE a workout here. 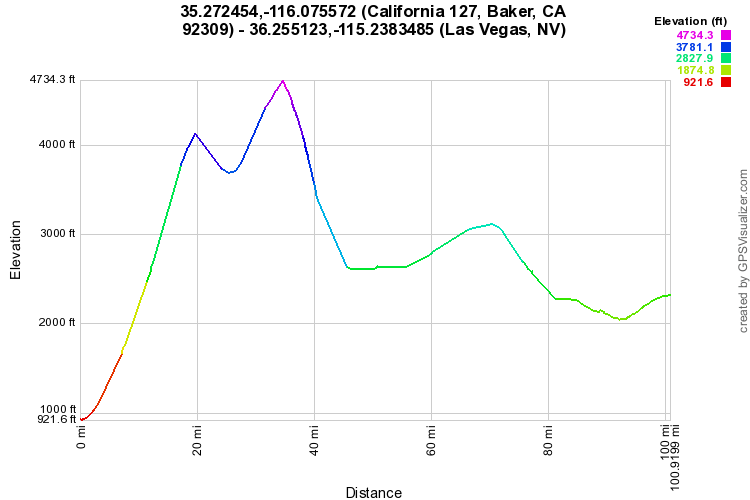 Then, we have one of the biggest climbs as we leave Baker and head towards Las Vegas. 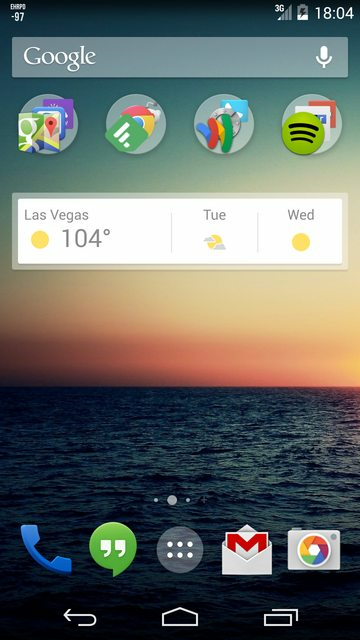 There are many chargers in LV so no worries there. After Las Vegas, we'll be heading all the way to Littlefield, AZ where there is an EV-friendly RV park, once again using the OpenEVSE. 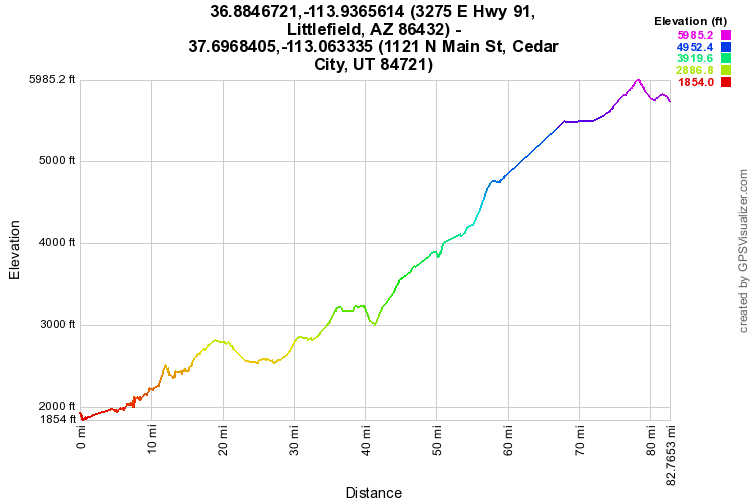 Then we have another big grade on the road up to Cedar City, UT but it's only 82 miles so shouldn't be tricky. If it looks like we're coming up short there's another RV park in between, but I think we'll be okay. And then the last leg into Milford! We'll be able to use a dryer outlet with the OpenEVSE where we're staying so will be able to get around easily. All in all it could probably be done with one or two fewer stops, but never having driven the RAV4 on a road trip I wanted to be somewhat conservative about it. Part of the reason we're doing this trip is to prepare for the BC2BC rally in August so that we have a good idea of the range on the RAV4 and can plan accordingly. We also got a little Coleman SUV air mattress that fits perfectly in the back with the seats folded down. Tested that at home and it was comfortable for two. I picked up a heatshielf for the front windscreen and front side windows which will add some privacy as well as keep the heat down during charging sessions. We've got a couple camping chairs, the OpenEVSE and various adapters, board games, luggage, and a full size cooler and still have loads of room to spare. I'll update this thread as we go so you all can follow along. We wouldn't have had the confidence to do this trip if it weren't for the all the helpful info on this forum. I also want to thank Chris and Glenn for helping me get the OpenEVSE built in time, ehelmholtz whose design I based mine on, pchilds and nsayer for their advice, as well as everyone else who's posted with information as I was working on it. You guys rock! Wow, Devin! This looks like a fun trip. Take and post photos along the way if you can. Sounds like a good plan! Just curious, did you consider getting a portable (gas) generator to take along just in case some of the places you are planning to recharge are, for some reason, unavailable? Even if you don't need to use it, would it be good to reduce (eliminate?) any degree of range anxiety? GOOD LUCK and keep us posted on your progress! Nice! I love the air mattress idea. I was wondering how you were going to spend ~5 hours waiting for a top off at the AQMD. I don't think I could suffer such a trip without at least dual chargers. 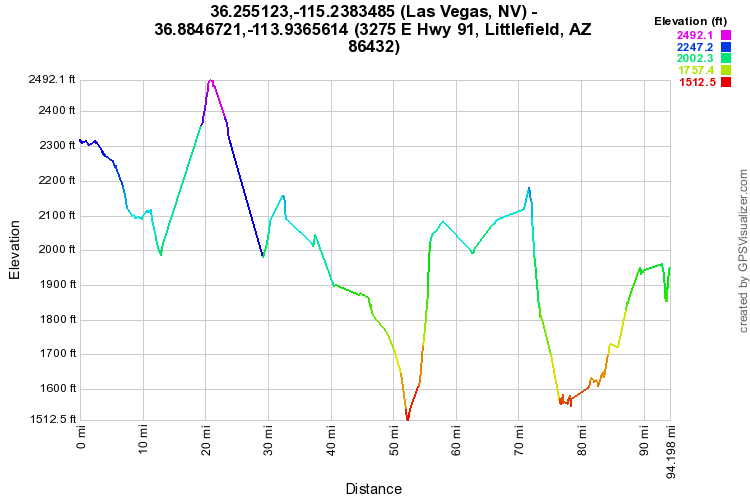 I hope you find RavCharge helpful to estimate your range and charging speed during the trip! Made it to Baker with 45 GOM miles to spare! Luckily the RV hookups were completely unoccupied and functional. The OpenEVSE is working like a champ. It's about 102 degrees and we have an excellent view of the giant thermometer from the car. We did manage to park under a tree which makes it more bearable, thanks to the 30' 14-50 extension cord. Unfortunately the 3G service here is too slow to upload pictures but I've been taking them as well as logging the details of each leg in between charges. I also have been saving my dashcam footage to another drive and I'm planning to stitch it together and speed it up to make a time lapse of the journey. Oh, and fooljoe - I forgot to thank you as well because Ravcharge is awesome and really helpful - especially with the new power averaging feature. 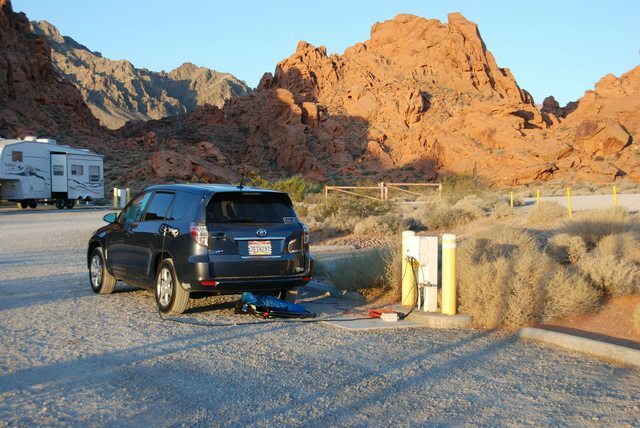 Now we're just trying to decide our Las Vegas charging point on Plugshare. There are too many to choose from - a luxury problem to be sure. Can you tell if the battery is actively cooling using the air conditioner while you charge? Sounds like an awesome trip. Good luck! It doesn't seem to be, at least it's not making any noises during charging that it doesn't normally make - no sound like the regular AC compressor that I observed at least. Greetings from scenic Leeds, UT! 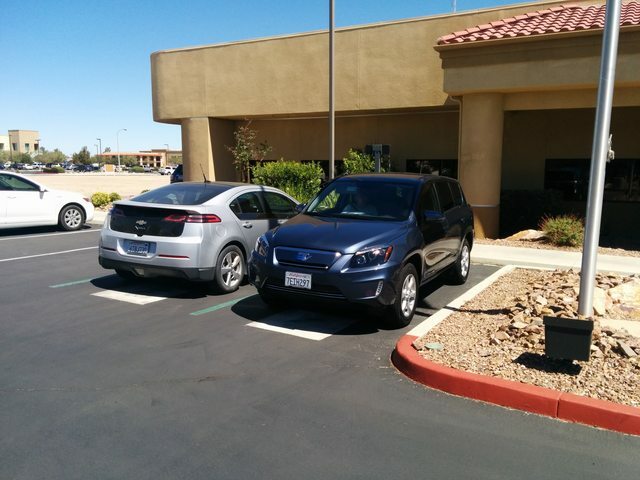 We are currently charging up at the Zion West RV Park which is very EV friendly. The owner only asks $5 to use any vacant 50A spot and she provided the WiFi and restroom codes and there's an air conditioned laundry room we can sit in if we're so inclined. It's actually nice out, only 91 degrees with a breeze and the park is filled with trees that provide shade. It's surrounded by fields and picturesque mountain ranges and is a pretty nice place to spend a couple hours. I'll post some pictures of that later. For now though, here's how the rest of yesterday panned out. We left Baker at about 3pm and made it to Las Vegas in about 2 hours. Our first choice to charge was closed for the day so we wound up going to the Trump International Hotel, which was the ideal choice. The valets were eager to help even though we weren't staying at the hotel and plugged the car in using the OpenEVSE to a NEMA 14-50 outlet they have on the top floor of their parking garage. There was no fee for the valet parking so we made a point to have dinner at the hotel's restaurant and tip the valet. We left Vegas a little after 9pm and I decided to alter the plan a little. 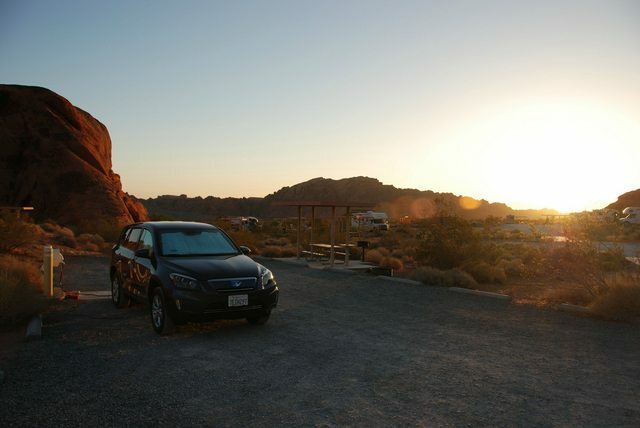 We arrived at the Valley of Fire State Park a little before 11pm and found several vacant RV sites with 50A service at the Atlatl Rock Campground. We paid $30 (by cheque) using the self-pay envelope/kiosk ($10 park entry + $10 camping fee + $10 RV hookup fee). We set up the OpenEVSE and inflated the air mattress. It was still pretty warm (about 90 degrees out) and I wanted to use pre-climate to cool the car down a bit using the mains power but since there was no cellular data service I couldn't do it. We cracked the windows and enjoyed a warm night. It occurs to me now that we should have just left the car on and unplugged with the AC running overnight (we had over 50% SOC) and charged up fully in the morning. When morning came the park's beauty was revealed. This is an absolutely amazing place - and a worthwhile destination in and of itself. There were nice, clean showers at the campground which didn't require any additional payment so we had a leisurely morning getting up and ready. On our way out we stopped by the park's visitor center which is really well-designed and informative. We scoped out some of the other interesting sites within the park (Elephant Rock, Mouse's Tank, Petroglyphs, etc.) and have already decided that we will stop here on our way back home and spend a day in the park exploring. Once we left Valley of Fire we used the north road to exit the park and connect back with I-15. After about 110 miles from the campsite we arrived in Leeds and this will be our last charging stop before Milford. Wow!!! Sounds like a great trip so far! Thanks for the pictures and all your feedback. In picture #2 (above) it looks like you are charging on a 120V cord. 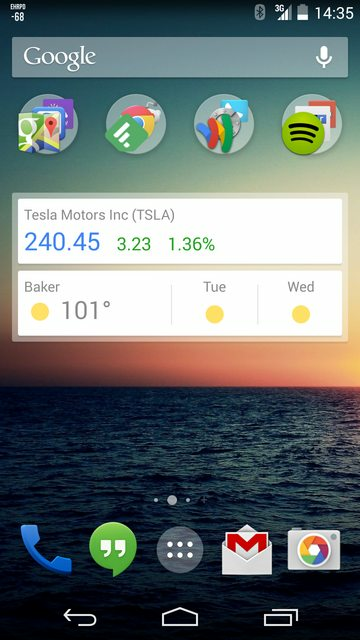 Are you finding that L2 charging is "catch as catch can" in some less traveled places? Doyou know if most places allow ChargePoint members to charge?